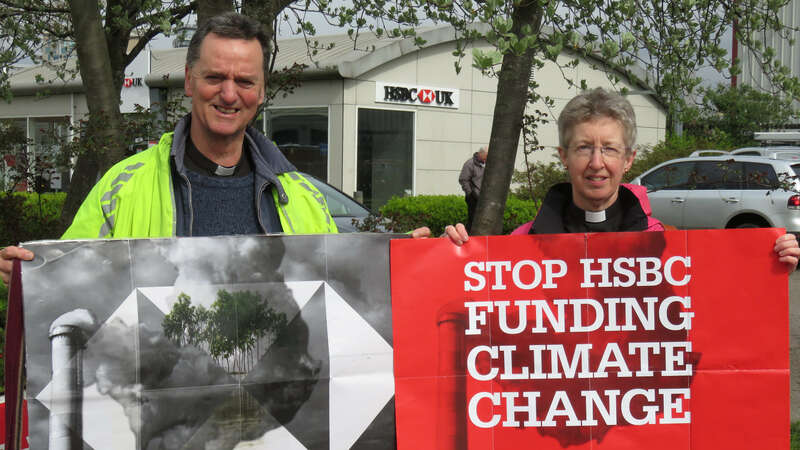 Christian Aid’s on-going climate campaign (#BigShift) is now focusing on HSBC because of their continued funding of massive new coal projects in Bangladesh, Indonesia and Vietnam. These three countries have some of the largest pipelines for new coal power projects in the world. The projects once finished will release huge amounts of carbon dioxide (CO2) and harmful residues into the air and sea, damaging the environment and local people’s health and livelihoods. Big Change campaigners outside HSBC branch in Didsbury. The Paris Agreement, signed in 2015 at COP21 climate conference, aims to strengthen the global response against climate change by reducing CO2 emissions to limit further increases in average global temperatures to between 1.5 to 2.0 degrees Celsius. But to achieve the goals set out in Paris, no more new CO2 emitting power plants or factories can be built. In fact to reach the Paris targets research shows that 20% of global coal power infrastructure has to decommissioned early. The bank’s branches have been visited by Big Shift campaigners from environmentally conscious organisations such as Christian Aid and Friends of the Earth to ask the bank to stop funding climate change and pollution, particularly while investing in overseas countries. Branches of HSBC across the UK will see some form of action before Easter, be it musical with the singing of hymns or songs on environmental topics, pickets, stalls or delegations representing local supporters with petitions. Or the handing in of cake with iced pro-environmental message’s on top as happened in Bramhall, Stockport, when Maurice Heneghan and Margaret Clarke visited the HSBC branch, on 14 March. The cake was accompanied by a formal letter to John Flint, Chief Executive of HSBC, asking HSBC to stop funding climate change. Campaign cake being handed in to Bramhall branch. Formal hand-ins have already taken place locally in Stockport, Didsbury and Ashton; Bury and Oldham are happening this week; others have been confirmed for Chorlton, Rochdale, Bolton, Leigh and St Ann’s Square in Manchester. At the Didsbury HSBC branch on 6 April, Roger Newton of Christ Church, South Manchester, was incensed by the actions of HSBC, having been a customer for 50 years and also a staunch environmentalist. Whilst acknowledging that the bank had made funding commitments to combating climate change he said that the bank should be concentrating entirely on green energy. “Leading scientists and the Intergovernmental Panel on Climate Change tell us we have 12 years to stop catastrophic climate breakdown. The communities that we work with around the world are already suffering from the actions of the fossil fuel industry. That’s why we believe that we have to do everything we can to make sure that those financing dirty fossil fuels are held to account. “HSBC has agreed to invest $100 billion in tackling climate change by 2025. This is fantastic. But it’s still shovelling money into fossil fuels as if it’s coal going into a steam engine heading for a cliff edge. HSBC’s PR campaign is trying to rescue their reputation after multiple large scale banking scandals that have severely polluted their high street bank brand. Last year they were fined $756m in the US for their actions which contributed to the financial crisis in 2008. In 2017 they were forced to pay €300m to the French authorities to avoid a trial over their involvement in hiding €1.67bn from the taxman. And HSBC’s blatant failure to implement anti-money laundering controls, allowing drug traffickers to clean at least $881m of illicit cash, led to a record breaking fine of $1.9bn (£1.2bn) from the US authorities. These are just some of a long list of HSBC’s indiscretions. To try and improve their tarnished reputation they are spending big money on their PR campaign. The recording artist Jean-Michel Jarre, was commissioned to create theme music for HSBC. A national poster campaign aims to flatter people with references to local cultural icons. The Manchester version says “You’re not just a worker bee”. Other cities are similarly smarm-charmed with tailored posters. HSBC’s charm offensive uses the slogan “We are not an island” in the UK. This appears repeatedly on cashline screens, plaques, and stationary. Similarly it’s “Global citizen” advertisements conclude with the assertion that “… we are part of something far, far bigger”. The bank seems justly wary of reputational damage. Branch staff appear to have been briefed not to interact with delegations and some have seemed nervous, saying their branch is a service branch and doesn’t have a manager or anyone campaigners could speak to. Staff at suburban branches have tried to deflect petitions to a city/town centre branch. To increase pressure in the run up to HSBC’s AGM this year, awareness-raising has also been carried out outside branches using street furniture with notices and flyers produced to explain the campaign to the public. If HSBC wants it’s global image regarded positively and its strapline ‘We thrive together’ to mean anything, they need to genuinely clean up their act, without reservations.